2-Canister Countertop Fluoride Water Filter Plus. Countertop filters do not require a plumber. Chrome finish is an option. Anyone can use this, but because the diverter simply screws onto the kitchen faucet (no plumber needed), people in apartments generally get a countertop unit. This filter is appropriate for municipal systems. 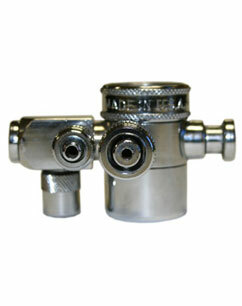 Will fit any kitchen faucet as long as your main faucet is not itself a sprayer. THERE IS NO DIFFERENCE IN FILTRATION BETWEEN UNDER-SINK AND COUNTERTOP FILTERS. All of our kitchen canister filters take out chlorine. If you have chloramine, you need a filter that specifies it filters chloramine. Call your water supply company or do a web search for your town’s Water Quality Report to see if it lists chlorine or chloramine. (And to see if your water is fluoridated.) Or email us with your town and state (not zip code) and we’ll check for you. The wide-spectrum plus microfiber option adds filtration of plastic microfibers and cysts in addition to the filtration of metals, chemical and organic contaminants, leaving good tasting water. Click the link to see the blog on microfibers. Folks, don’t wait until you are frightened by some particular contaminant proven to be in your drinking water the day they tested it. We know for a fact there are hundreds of them. 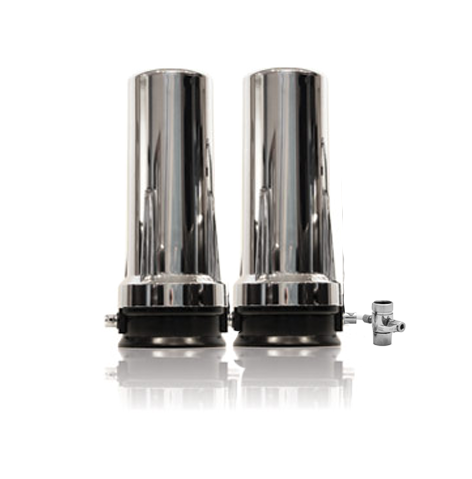 Get quality kitchen filters that work on all the categories of contaminant. Fluoride is the active ingredient in rat poison and Prozac. Learn more about why you want to Remove Fluoride. 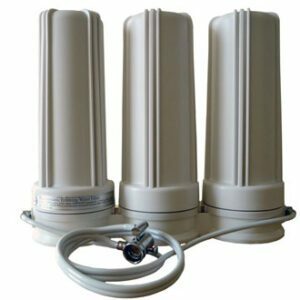 If your municipality uses chloramines not chlorine, you should get a filter that targets chloramines, which are harder to remove. 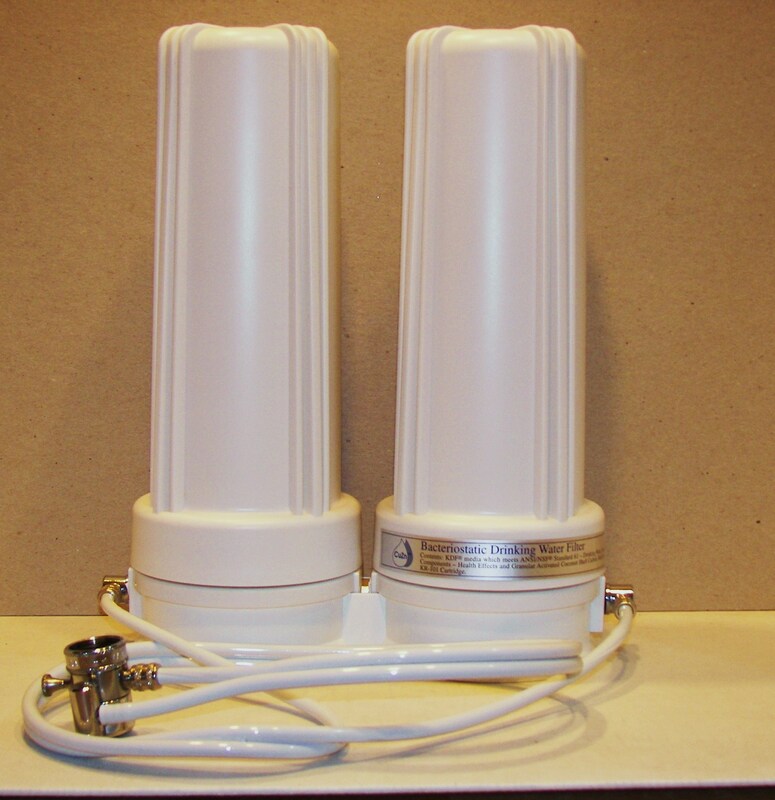 See the 3-canister chloramine version which is this filter plus a chloramine cartridge. This filter works on all the categories of contaminants. These have more filter material than others, which results in more filtration! There is excellent strong water flow through this water filter and all of our filters. The kdf in these filters has been processed using the patented FOAM ADVANTAGE. This means a higher level of filtration with less kdf – leaving more room for the other media in the canisters so they also deliver more filtration. Click to learn more. Water flows freely through each of the different filter media. Bacteria cannot grow in the carbon because of copper-zinc kdf. The best-of-all-worlds filtering – takes out the bad, leaves healthy trace elements. CHOOSE EITHER a full pound and a half of activated alumina (no, this is not aluminum! ); OR calcium-based carbon. We do not recommend one over the other. This filter uses multiple filtration methods. The types of filtration include ‘pore opening’, magnetics, catalytic action using reduction-oxidation, electroplating, ion exchange, reshaping of hardness ions and adsorption. An environment harmful to bacteria, algae and fungus is created. The water acts softer. Another customer has an extreme allergic reaction to chlorine. Her hair even starts falling out when she is exposed to it. She tests her water so that she knows right away when chlorine starts to break through. She let us know that after more than 10 months there is still no chlorine in her water. This unit delivers excellent water filtration. 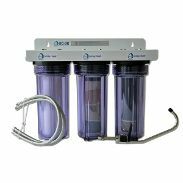 The filtration is the same as the 2-canister undercounter fluoride plus water filter. This much of the right filter media has been shown to effectively remove FLUORIDE. It will start between 90 and around 95% removal for most people. Over the life of the fluoride cartridge, it may drop to 78 or 80%. Water chemistry is complex. These are realistic estimates, but specifics vary. We do not recommend one fluoride-filtering media over the other. We offer two because they are available and both work very well. Calcium-based carbon is also known as bone char. To see a larger sample list of contaminants filtered, see What Is Filtered? . Includes a free plastic wrench to make changing filters easier. No wrench with chrome finish. 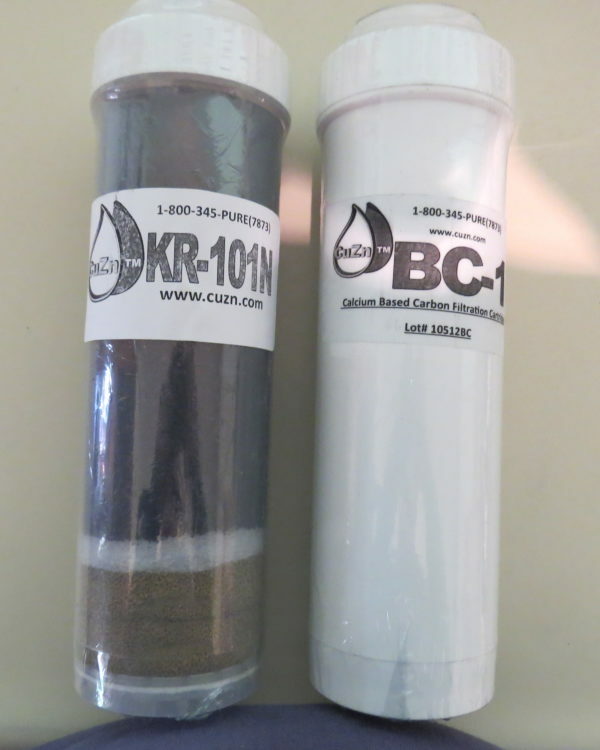 The FDA has certified kdf and all the filter media used in all filters we sell as releasing nothing harmful into the water. The EPA has certified kdf as compliant with Standards 61 & 42. The fluoride filter materials have been tested and approved to NSF/ANSI 53 for fluoride removal by the Water Quality Association. See Certifications. Also see the tab “Education” then Water Filters, Certifications & Test Results for lots more. Fluoride Plus Replacement Set Replace the set once a year. To see info on changing filter cartridges, see this page. I really like the taste of the water from this system. it is also good to know that the fluroide is taken out. All for a relatively low price. I have been using the Fluoride, Chlorine Plus for almost 3 years. It has been amazing, i made the decision before my first daughter came not to use the baby water sold in stores which are filled with fluoride and BPA. One of the best decision i ever made for her and the family. I tell my friends how great it is all the time. We love this product and i’m very satisfied. I have used the water filter since 2012. The water tastes great. But the real delight is that I am putting clean good water into my body and my friends’ bodies. I am treating myself with respect and love. In addition, the support from Friends of Water has been helpful, professional, and always reliable. I am so very glad I am using their product. I trust them. Our city water is chlorinated and fluorinated, the taste was not very good and the quantity of water I drink as well as my husband and family the cost of bottled water really adds up. I researched the web in search of a water purification system. I really didn’t want to bother with interrupting my plumbing, I just wanted something that was easy to install and remain on my countertop. I came upon Friends of Water and found just what I was looking for, a multiple stage system that attached to my faucet and could stay on my countertop (chrome finish). I had the best of both worlds. I was satisfied that this system satisfied my needs and also purchased systems for my parents (senior citizens who also should not be drinking water with fluoride and chlorine in it and can’t afford to keep buying bottled water.) The water filters arrived in less than a week. We installed the systems; talk about easy installation without a plumber. In less then 10 minutes had the freshest tasting water. We all agreed this was even better than our bottled water and now coming from our tap and with good pressure. We also liked that after turning off the system the faucet was fully usable for washing dishes, etc. I hope this helps anyone who is searching for something like this for their family. I would recommend this company to anyone. All my questions and problems are answered promptly. It is nice to have a knowledgeable person I can count on, pretty rare these days but much appreciated. Since I have gotten these units and as a result of drinking more water I have lost 25 lbs. I wish I had known about you guys sooner. My wife and I have had this combo for years now and truly appreciate the health benefits we’ve received by using this 2 canister counter top version that fits our condo space perfectly. The water tastes clean and great. We love it! I’m loving my kitchen water filter. The customer service team was amazing. They understood my budget and worked with me to find a good fit. We have cut back on plastic water bottles now that we have safer drinking water and I wish I had gotten it sooner. I feel better knowing my family is drinking safer water.